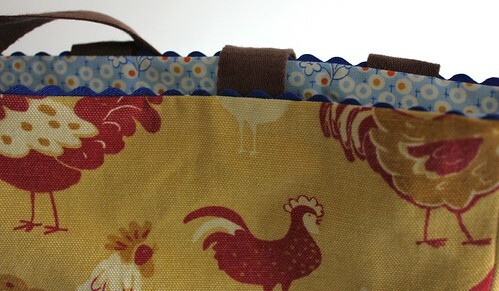 Last week, I posted a tutorial showing how to trim the top of your tote with corded piping. Today, we’ll follow a similar process to install rickrack. 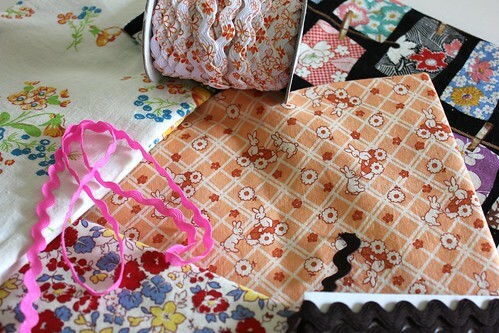 Is it possible for a project containing rickrack to have a modern, un-vintage feel? My hunch is yesmaybe, but I know that’s not when I tend to reach for it. I like a lot of diverse styles at different times, but one style of print I find myself drawn to repeatedly is floral feedsack/floursack. 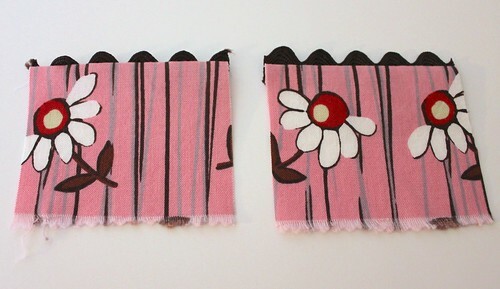 When I use those fabrics, or others heavily influenced by an era-gone-by, I often consider embellishing with rickrack. People do all kinds of things with this humble little garnish… Aside from edging, it’s frequently used as a flower stem, the flower itself, and here it’s even a cute caterpillar. I admit that I haven’t branched out with it much, but even just as a trim, it’s hard to beat. 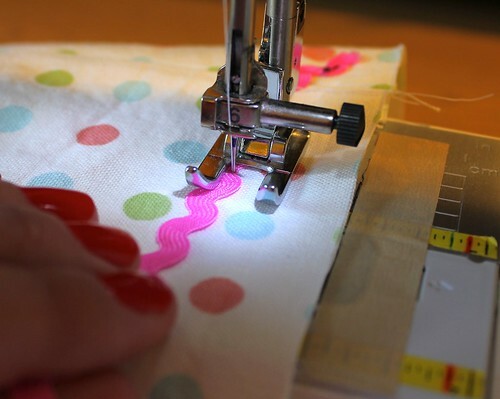 In many ways, trimming with rickrack is quite easy — buy it pre-made in tons of colors, no special foot needed for assembly. The only tricky part is ensuring that it’s attached straight, which in the case of this project, we’ll do by basting. Some folks like to see just the humps, as shown on the left. And some want both the peaks and valleys, like the one on the right. Which side are you on? You have a few minutes to decide, until we begin step 4 below. 2) Construct the exterior. Place the two exterior pieces right sides together. Sew along the sides and bottom, leaving the top edge open. Cut a 2½” square from each of the bottom corners of the bag. Press side and bottom seams open. At each cut corner, bring side and bottom seams together and stitch across to create the box bottom; trim corner seams. Turn bag exterior right side out. 3) Construct the lining. Do this the same way as the exterior, but leave a 4″ gap along the bottom seam for turning out later. Turn the lining right side out. 4) Baste the rickrack to the bag exterior. Start with the sewing machine setup. The thread in your needle should match your rickrack. In your bobbin, it’s helpful to use a color that you’ll be able to see easily against the wrong side of the fabric, as you’ll be following those basting stitches during final assembly. 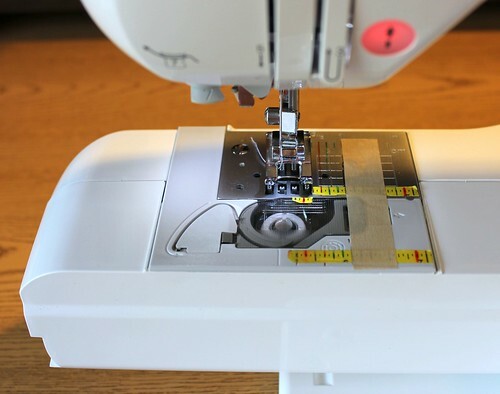 If you don’t have a 1″ seam allowance clearly marked on your sewing machine, you can do so by putting a piece of removable tape at the right spot, as shown below. Lastly (and these are helpful but totally optional), use your machine’s free arm and an open toe presser foot, if you have it. Mark a spot 1″ from the top raw edge at one of the side seams. At this mark, align the rickrack as shown below. Basically, you want to angle the trim so that it “starts” right at the seam but no raw edge is exposed. Pin or tack in place. 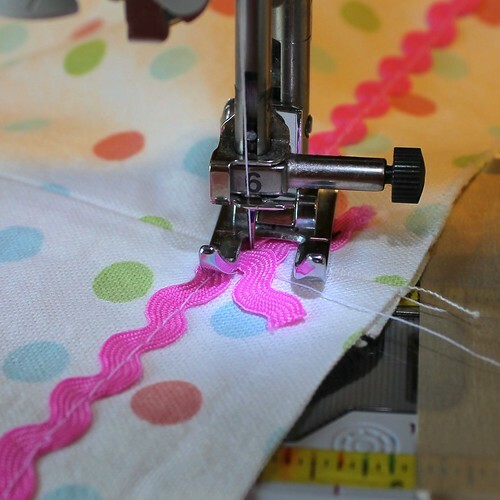 At your machine, align the bag’s top raw edge with the 1″ marking, and position the starting seam and rickrack below the needle. Based on your decision about humps-only or peaks-and-valleys, keep in mind that the part of the trim to the left of your basting stitch is what will be shown at the top of your bag when it’s complete. As you begin to sew, keep the fabric lined up with your right hand, watching the raw edge to ensure that it stays steady at the 1″ seam allowance marking. With your left hand, guide the trim so that it stays straight. This is actually the one place where I, with admitted perfectionistic tendencies, find rickrack slightly challenging. Go slowly, and if it goes off course, just stop and unpick a few stitches if necessary. Your precision here will be rewarded, because this basting line will be the guide you’ll follow when doing the final tote assembly. 5) Attach the handles. On the bag exterior, make a mark 3″ in from the side seams on both back and front. With raw edges aligned, pin the outside edge of the handle at the mark; repeat for the remaining handle ends. If the handles have a right side, it should be facing the right side of the bag. Baste in place. Turn bag exterior wrong side out. 6) Assemble the bag. Place the right-side-out bag lining into the wrong-side-out bag exterior, so that the right sides are together. Ensure that the handles are fully enclosed between the layers. 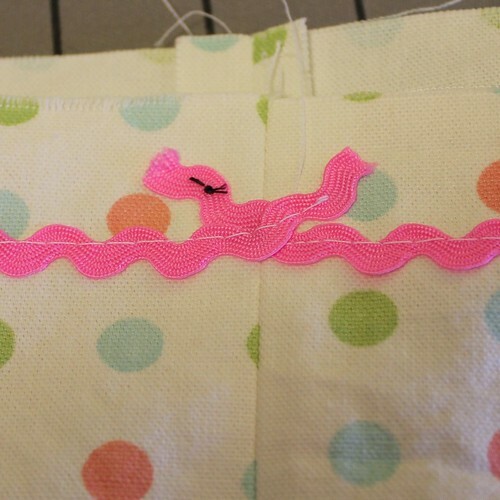 Align the side seams and pin around, then stitch directly on top of the rickrack basting stitches. 7) Finish it up. Turn the bag right side out. Press the top edge well. Topstitch around the top edge of the bag if you’d like. Handstitch the gap in the lining closed. 8) Make the bottom insert. Stack the two pieces of interfacing and baste them together. Working with the insert pieces you cut from your lining fabric, press one short edge 1/2″ to the wrong side; repeat on the other insert piece. Place the pieces right sides together, with raw edges and pressed edges aligned. 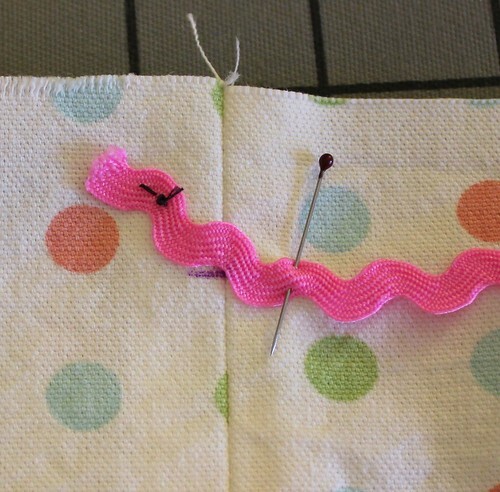 Stitch around three sides, leaving the pressed edge open. Turn right side out. Insert the double-thickness of interfacing. Slipstitch or whipstitch the open end closed. 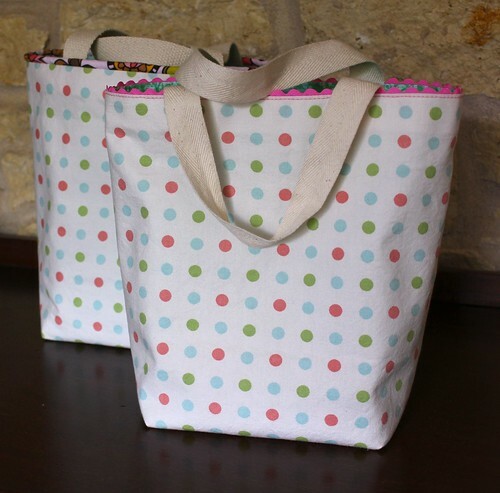 Place insert into the bottom of your tote, tacking them together at the corners, if desired. The second time was only slightly better — I tried to install the trim prior to assembling the exterior, and the rickrack went wonky at the side seams. So I pulled out my seam ripper, proceeded to publish the tutorial for the piped tote, and adapted the rickrack basting process to what is outlined here. I had really good results doing it this way. I’ll still use the first bag, and I might be the only one ever to notice its imperfections. But I wanted this tutorial to enable you to reach super-straight rickrackness, and I hope I’ve met my goal. Let me know! 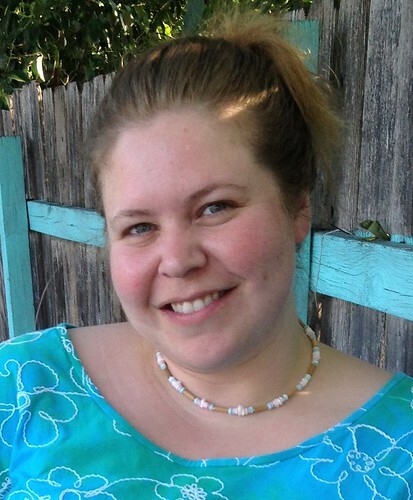 Have you come across any awesome uses of rickrack lately? Have you seen it used with a modern or even futuristic result? Don’t forget, if you make this or any other Rock the Tote, I’d be thrilled to see a picture of it in the moonthirty Flickr group! This is a great post…I really love ricrac! 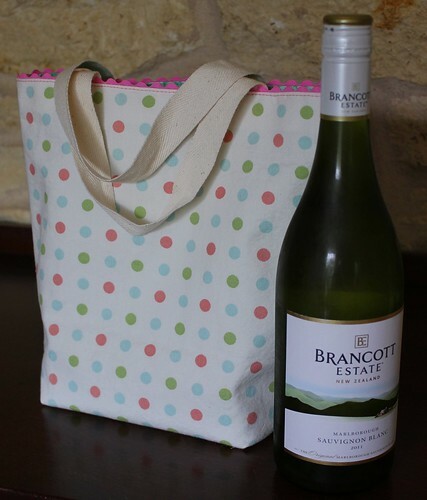 I hadn’t thought of using it that way at the top of a tote…it looks great, and I’ll have to try it! I have a TON of ricrac (never knew what it was called) that I inherited from my grandmother’s sewing stash when she passed and I never had a clue what to do with it. I LOVE this idea and I now know exactly what my mom and sister-in-laws are getting for Christmas next year. I’m not a speedy seamstress with a 3 year old around, but a year ought to be enough time to make a respectable collection of gift bags!